The King openly proclaimed his love of parliaments, his devotion to the immemorial constitution of balance and moderation, his Protestant fervor, and his pious hopes for a national church. 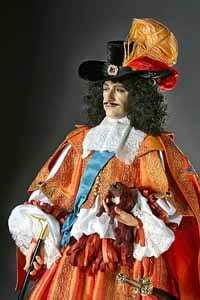 The Restoration refers to the restoration of the monarchy when Charles II was restored to the throne of England following an eleven-year Commonwealth period during which the country was governed by Parliament under the direction of the Puritan General Oliver Cromwell. This political event coincides with (and to some extent is responsible for) changes in the literary, scientific, and cultural life of Britain. During this time, a premium was placed on the importance of human reason and on an empirical philosophy that held that knowledge about the world was through the senses and by applying reason to what we take in through our senses. Reason was an unchanging, uniquely human characteristic that served as a guide for man. Thus this time is often also called the Age of Reason or Enlightenment. Characteristics of this period included observing human nature and nature itself which were considered unchanging and constant. The age is also known as the Neoclassical period. Writers of the time placed great emphasis on the original writings produced by classical Greek and Roman literature. The literature of this period imitated that of the age of Caesar Augustus, writers such as Horace and Virgil, with classical influences appearing prevalent in poetry with the use of rhyming, and in prose with its satirical form. The Augustans deemed classical literature as natural, that these works were the idealized models for writing. The Neoclassical “ideals of order, logic, restraint, accuracy, ‘correctness,’ decorum,. . . would enable the practitioners of various arts to imitate or reproduce the structures or themes of Greek or Roman originals” (Victorian Web). Alexander Pope furthers this idea as he says “Learn hence for ancient rules a just esteem; To copy Nature is to copy them” (Essay on Criticism). The way to study nature is to study the ancients; the styles and rules of classical literature. Closely allied with the emphasis placed on the classics and the unchanging rules of nature was the belief that reason was an unchanging and unique human quality that served as a guide for man. Literature during this period was often considered a tool for the advancement of knowledge. Writers were often found observing nature in their attempts to express their beliefs. Human nature was considered a constant that observation and reason could be applied to for the advancement of knowledge. Within these circumstances, the Age of Satire was born. Satire was the most popular literary tool that was utilized by writers of the time. With the help of satire, writers were better able to educate the public through literature. Its function was to acknowledge a problem in society and attempt to reform the problem in a comical manner while still educating the public. Its effectiveness can be seen in literary pieces by Jonathan Swift such as A Modest Proposal where he addresses and criticizes the problem of a growing famine in Ireland. Playwrights of the time were also known to incorporate satire in their plays. Through the use of satire, they were able to expose and critique social injustices. “Over the thirty years of its triumphs, Restoration comedy, in an astounding fugue of excesses and depravities, laid bare the turbulence and toxins of this culture” (Longman). Satire was a highly successful literary tool that worked to promote social awareness through literature, the theater and periodicals of the time. Damrosch, Daivd, and Kevin J.H. Dettmar. The Longman Anthology of British Literature. 3rd ed. United States: Pearson Education, Inc., 2006. Damrosch, Daivd, and Kevin J.H. Dettmar. “Essay on Criticism.” The Longman Anthology of British Literature. 3rd ed. United States: Pearson Education, Inc., 2006. Fielding, Henry. Joseph Andrews. 1st ed. United States: W.W. Norton & Company, Inc., 1987. “Neoclassicism: An Introduction.” The Victorian Web . http://www.victorianweb.org/previctorian/nc/ncintro.html 16 Mar. 2008. “Restoration Drama”. Theatre History. 2 Mar. 2008 <http://www.theatrehistory.com/british/restoration_drama_001.html>.